I’m calling these my kitchen sink bars because well, they contain everything but the kitchen sink. Oats, chocolate, coconut, peanut butter, honey and prunes! 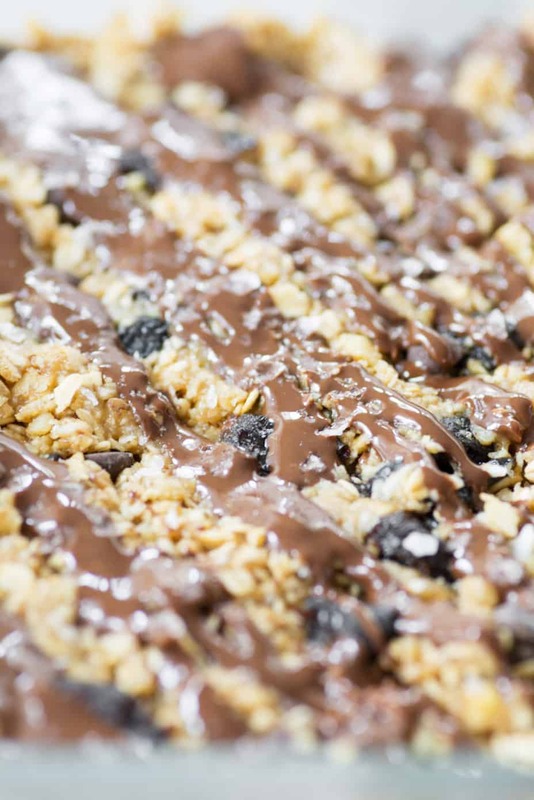 If you’re new to making your own granola bars, these are the perfect gateway recipe. Almost impossible to mess up and they become more delicious the more trashed-up they are. Tell me what comes to mind when you hear prunes. I’ll tell you what I thought of until a few weeks go: things I ate at my grandmother’s house and the food I give to Vander when he needs… a little digestive aid. Even if you don’t want to admit it, I know you likely think that too. Here’s what I now think about prunes: a delicious source of prebiotics (essential for gut health) packed with polyphenols and contain micronutrients that slow the catabolic impact on bone health. Oh yeah- and they taste like candy. 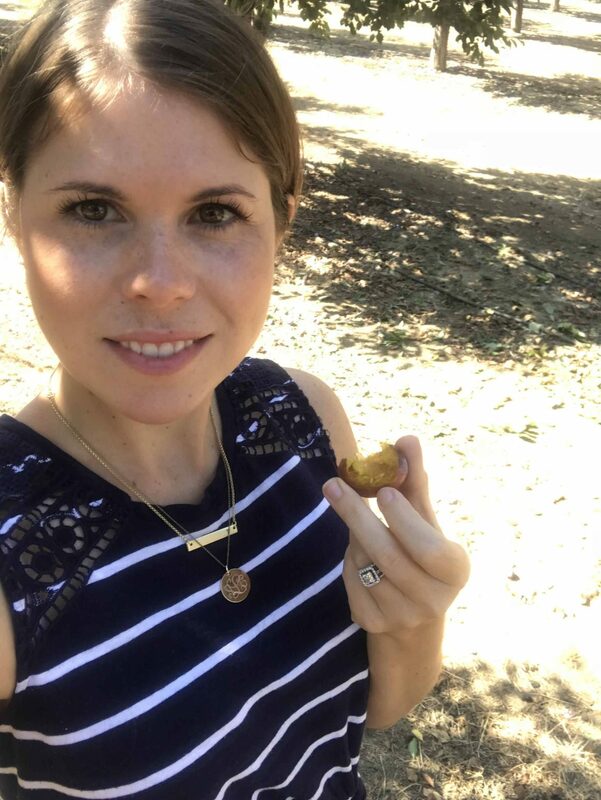 A few weeks ago, I was fortunate enough to spend a few days in the Napa Valley to learn more about California prunes. While I didn’t dislike prunes before the adventure, it wasn’t a food that I bought regularly. Since coming back, I’ve been eating prunes daily and have hooked both BL and Vander on them as well. Not all prunes are created equal; the premium ones are California prunes and they taste like it. I’m not exaggerating when I say that prunes are candy; California plums are soft and decadent with just the right amount of sweetness. They also contain more antioxidants than blueberries or blackberries! Now, I’m not in the business of ranking fruits and vegetables because they all provide health benefits, but this is interesting to note. Antioxidant levels in foods are measured using an ORAC score; and the ORAC score of prunes (5,770) is almost double that of blueberries (2,400). If you’re curious and for comparison, kale clocks in at 1,770 and pomegranates at 1,245. We tend to think of all of these foods as superfoods, when in fact prunes pack a more powerful polyphenol punch than all of them. Why so high? That’s what makes prunes unique. 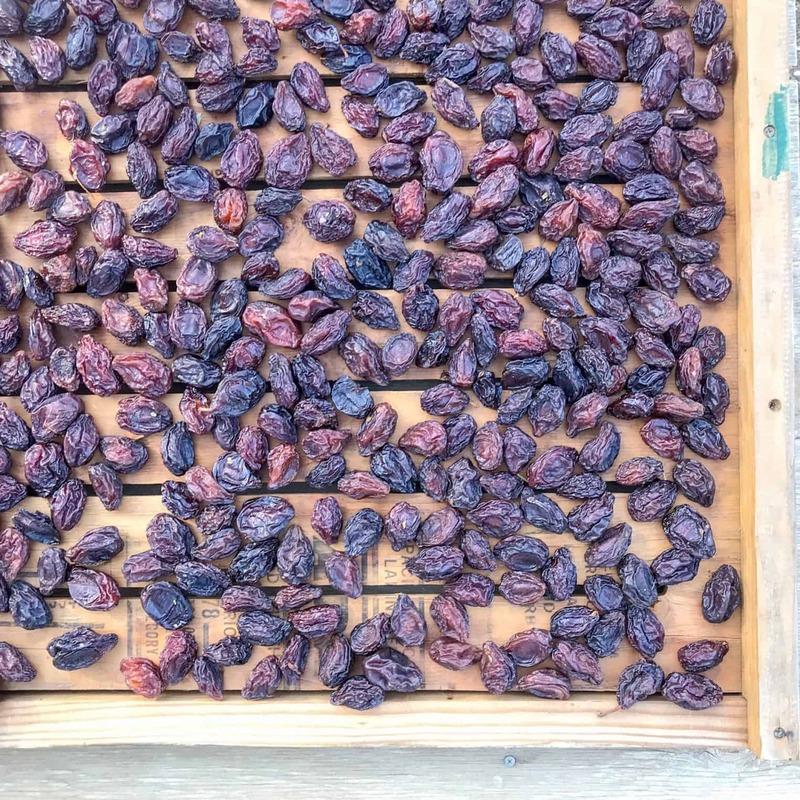 While plums are a great source of antioxidants on their own, the drying process concentrates antioxidants and other nutrients, making prunes a literal nutrient superfood. Grabbing a plum right off the tree. These are not normal plums, they are specific for prunes. Wow- so sweet! I’ve never had anything like them. So what about prunes as a digestive aid? If you need to get things moving, prunes should be your #1 pick. While prunes do contain fiber (great for motility and as a source of prebiotics), they also contain sorbitol, which makes them different from other dried fruits. Chemically speaking, sorbitol is a sugar alcohol, which means it’s not digested the same way as sugars. It’s this unique component that makes prunes both low glycemic and helpful as a diuretic and a laxative. It’s also why prunes are such a great food for gut health. 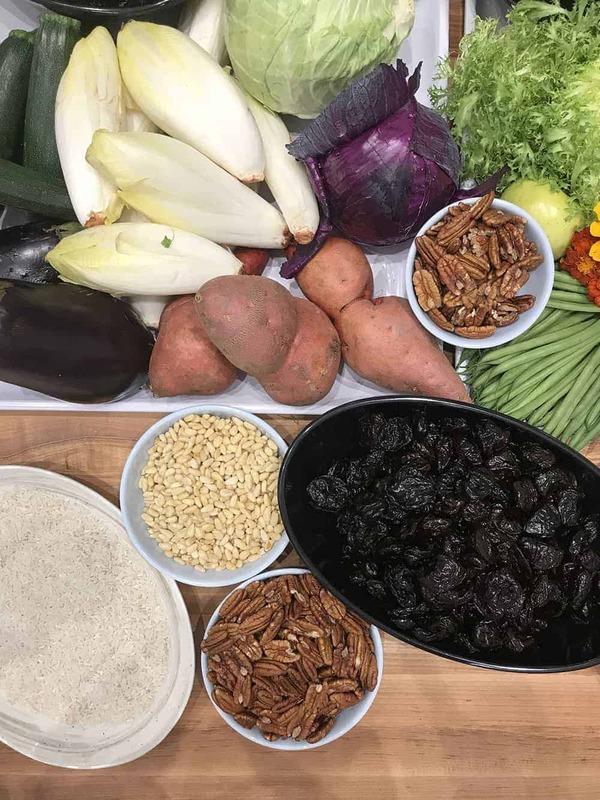 In addition to learning more about the nutrition of prunes, we spent a lot of time in the kitchens of the Culinary Institute of America, tasting prunes and coming up with dishes that highlighted their sweet flavor. One of the most interesting things that we did was a flavor pairing with one of the CIA chefs. 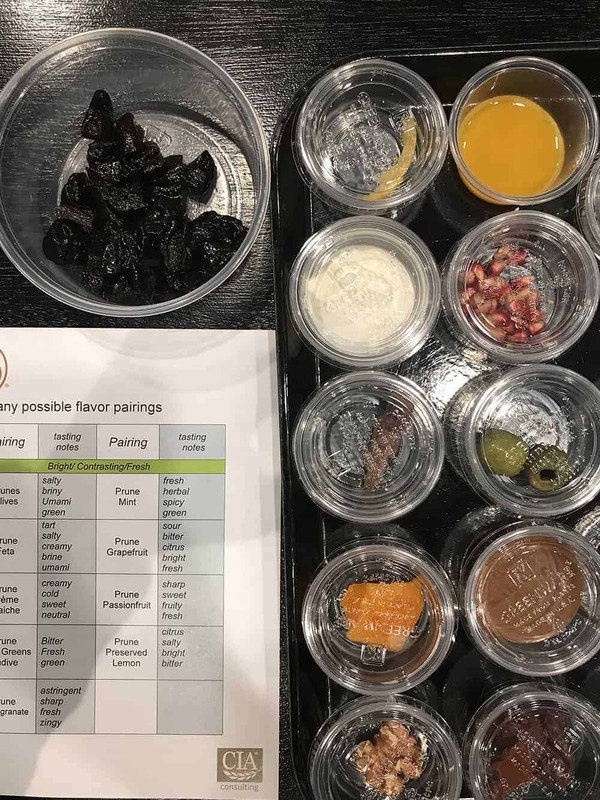 You can see the photo of the tasting above, and we paired each ingredient with a bite of prune and then compared notes. While most of them enhanced the taste of the prune, my favorite combinations were walnut, arugula, olive, miso and feta. In fact, I just tested a recipe last week for a farro salad with olives, arugula, feta, walnuts and yes, prunes. It was perfectly salty, sweet and delicious. That one is coming your way in the near future. The last thing I love about California prunes? They are a great budget choice. As fresh fruit (especially other antioxidant-rich fruits like berries) can be expensive, a bag of California prunes is a great option. You can pack a bag in your car, purse or lunchbox without worry that they are going to spoil. We’ve taken to eating a few prunes for afternoon snack, great for busy afternoons when I didn’t grab something ahead of time. Lastly- these bars. A hearty way to enjoy prunes! 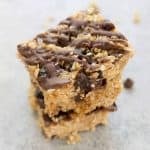 The technique is similar to the way I typically make granola bars, though I’m partial to all of the add-ins in this recipe. A word of caution- don’t add the prunes or chocolate until the very end or else the heat will melt the chocolate and make the prunes a sticky mess. The chocolate drizzle on top is optional; I love it for snack/dessert though I leave it off if I’m making these as a breakfast. Up to you! Either way, the sprinkling of sea salt on top brings the entire thing together. It makes the plums more sweet and savory (I know, but it just does) and highlights the chocolate and peanut butter. Enjoy! 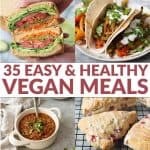 Everything but the kitchen sink bars! 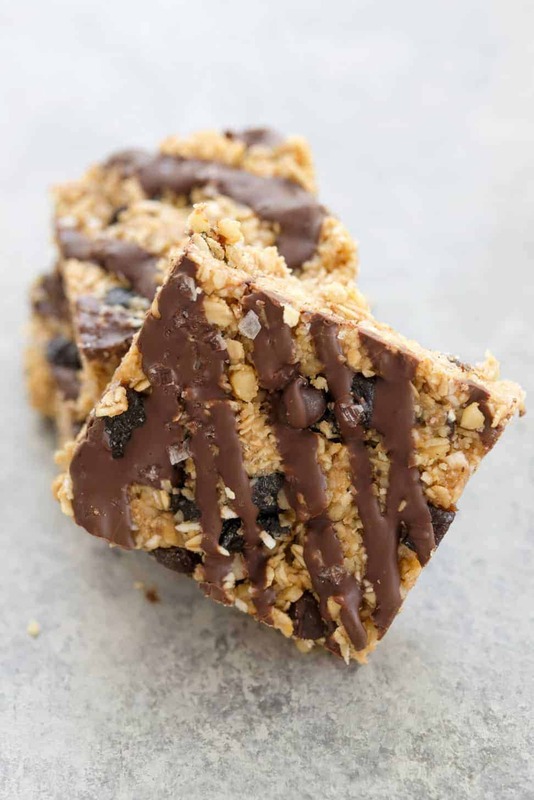 These salted chocolate granola bars are incredibly delicious and perfect for after-school snacks or dessert. 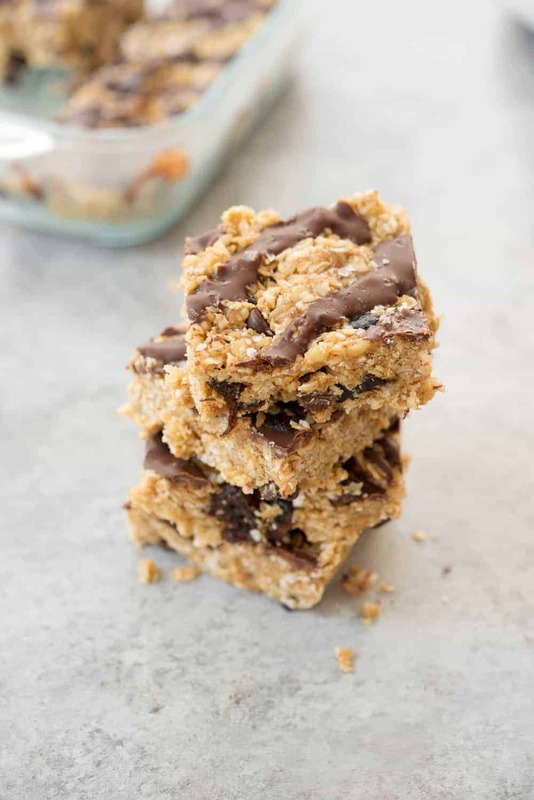 Packed with walnuts, coconut, peanut butter, prunes… and chocolate! Place the oats, walnuts, shredded coconut and salt in a large bowl and mix together. Place the peanut butter, honey, maple syrup and 1 tablespoon coconut oil in a medium saucepan over medium-low heat. Stir until melted together, then add in the vanilla extract. 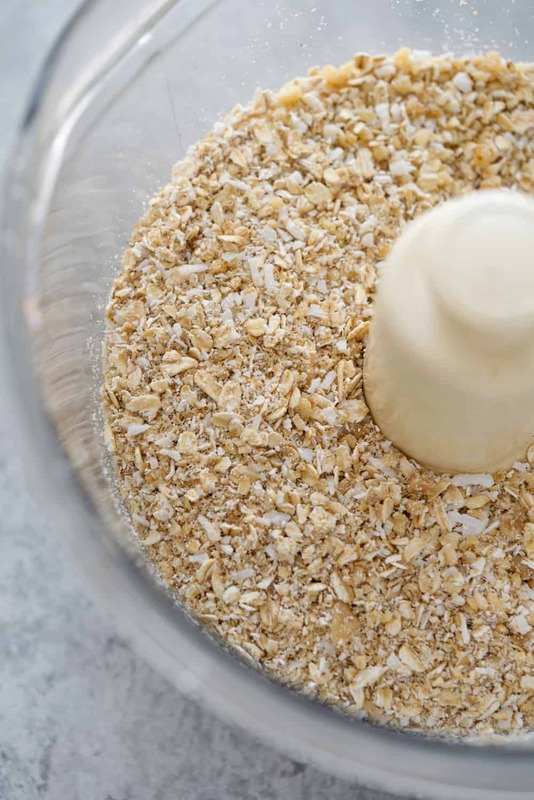 Add the peanut mixture to the oat mixture and stir together to combine. Mix in the chopped prunes, then press the mixture into an 8×8 inch square pan. 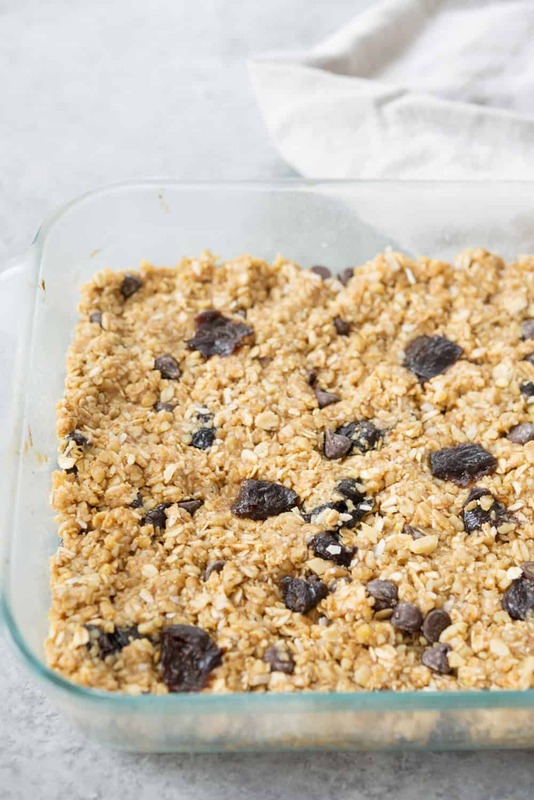 Place the chocolate chips and remaining tablespoon coconut oil and melt together. I do this in the microwave and stir every 20-30 seconds until fully melted. Spread on the prepared oats and place in the fridge until hardened, about 2-3 hours. Slice into 12 squares and enjoy. For best results, keep stored in the fridge. 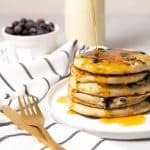 *I used all maple syrup in this recipe and thought it was too runny; I think honey is needed to help prevent these from being too ‘sticky.’ That being said, if you want to make these fully vegan, I’d suggest brown rice syrup instead of honey. 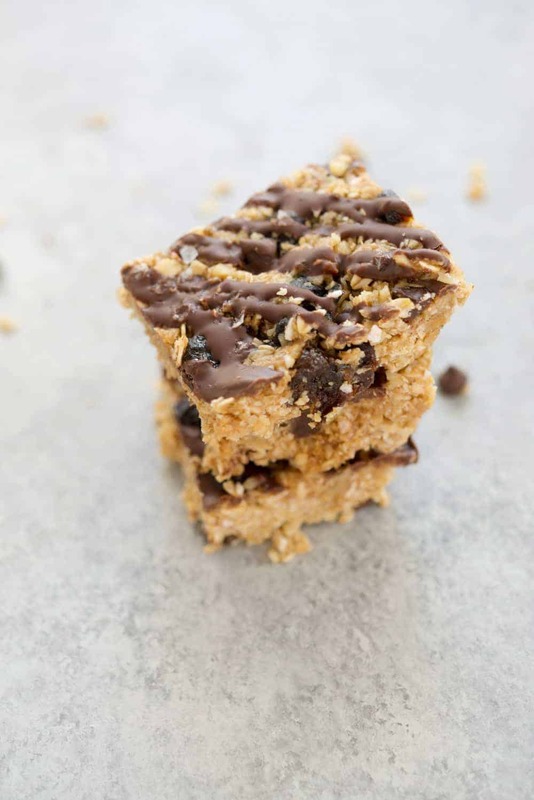 The perfect mix of sweet and salty- we love this recipe! Made this recipe with fresh picked baby carrots and skipped the maple syrup. Deeeeelish!! Couldn’t stop eating it. I’ve never wanted prunes so bad…. I actually bought the probiotic prunes a couple weeks ago. They were good! These bars are look so scrummy, Alex! Probiotic prunes!? I’ve never heard of these? Yes, we love prunes! I’ve been giving them to my son as well (just a couple for the week) and he loves them. They are like candy! So yummy!! A healthier treat/snack for kids and adults! Thanks for turning me on to prunes too! Thanks Alex! Prunes are the best! We love these bars.